According to the New Jersey State Athletic Control Board, all 20 “Strikeforce: Fedor vs. Silva” participants produced clean drug screenings following the February 12th event. NJSACB legal counsel Nick Lembo confirmed Thursday to MMAJunkie all athletes were tested for substances of abuse (such as marijuana and cocaine), as well as anabolic steroids and other performance-enhancing drugs. 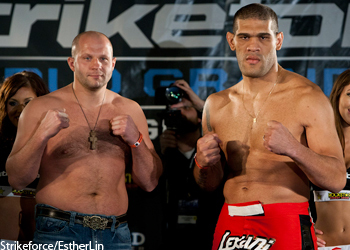 “Strikeforce: Fedor vs. Silva” took place inside the IZOD Center in East Rutherford, New Jersey. The Showtime broadcast featured the first leg of the company’s highly anticipated Heavyweight Grand Prix, and perhaps more importantly, the long awaited return of Fedor Emelianenko. Unfortunately for the Russian, he was upset in the tournament’s opening round by Antonio “Bigfoot” Silva. Sergei Kharitonov put former UFC champion Andrei Arlovski to sleep in the night’s other quarterfinals matchup.